2016 has been a wake-up call in the U.S., U.K. and beyond on the pain felt by many people from global trade. But this could be just the beginning. "What comes next in globalization? Be very afraid," says economist Richard Baldwin, who worked on trade negotiations for President George H.W. Bush and has just published "The Great Convergence: Information Technology and the New Globalization." President-elect Donald Trump is focused on the 5 million U.S. manufacturing jobs lost since 2000 due to globalization and technology. That was the Phase 1 of globalization. Now get ready for Phase II when robots and low-cost workers abroad replace service sector jobs too. Phase II could have an even bigger impact on jobs. Consider that the U.S. has created about 12 million service sector jobs under President Obama alone. "We could have hotel rooms in New York cleaned by people sitting in Guatemala driving robots," Baldwin says. "This isn't Star Trek." Higher skilled jobs won't be immune either. Already surgeons can perform operations by directing robots from remote locations. It doesn't matter if the doctor is a few feet away or thousands of miles away. He calls it Remote Intelligence or RI. "I'm amazed people haven't caught onto it yet," says Baldwin. "Everyone is fascinated with Artificial Intelligence. What we should be worrying about is Remote Intelligence." This next phase of globalization is "wilder" and "generally less fair" warns Baldwin. He predicts the anger and frustration already felt in many blue collar communities in the U.S. and Europe is only likely to spread. "You should help individual workers adjust," says Baldwin. "That means...providing training, relocation support, income support and continuing education." The U.S. has some programs like this, especially at community colleges, but overall, the nation spends very little on worker re-training compared to Europe and Japan. 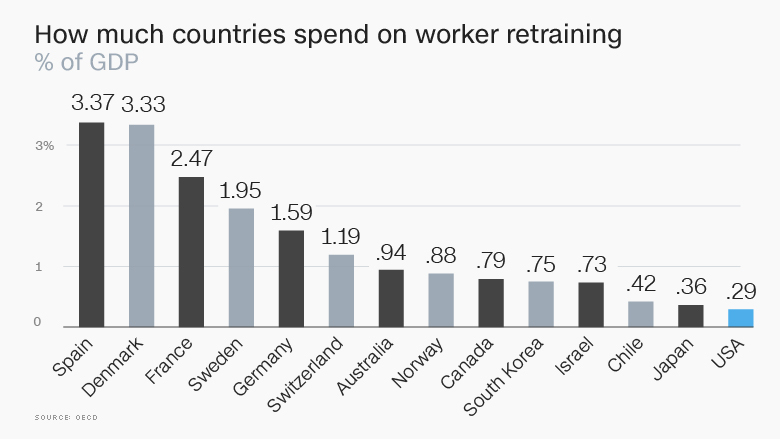 Even poorer nations like Chile spend a greater share of the country's annual income (known as GDP) on worker aid and training than the United States. Baldwin argues that President-elect Trump's tactic of saving jobs at the Carrier plant in Indiana is a Band-Aid approach. Globalization isn't going to stop. 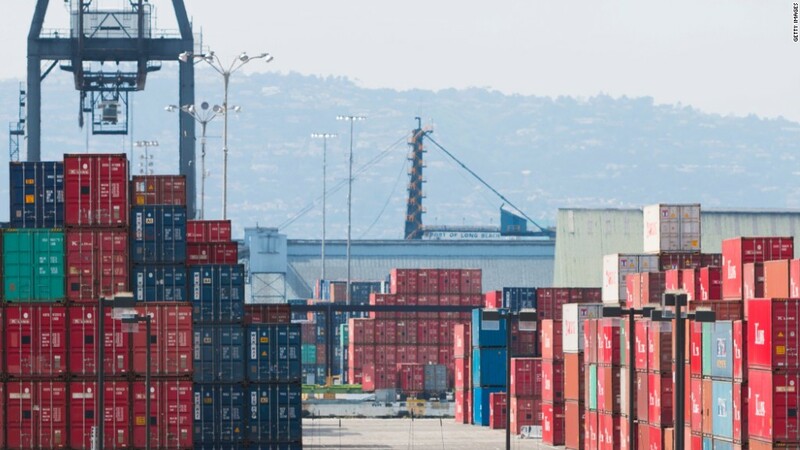 "Shutting off trade abroad won't save workers' jobs. They might just bring jobs back for robots at home," Baldwin says. (Already Carrier has said it plans to invest in upgrading technology at the plant in Indianapolis, which may mean machines can eventually perform more tasks that humans once did). In his new book, Baldwin makes the case that globalization is still good, but governments and society have to do a far better job of helping workers. Step 1: Accept the 21st Century reality that low-skilled manufacturing jobs are not coming back. Baldwin says using tariffs (a plan the Trump team is considering) to try to stop factory jobs leaving won't work. "If Trump shuts off trade flows, that will just lead to more automation," he says. Furthermore, it's not just blue collar work moving overseas now, but technology and ideas. That's even harder to stop with tariffs, he argues. Step 2: Help workers retrain -- or even relocate. "We shouldn't try and protect jobs; we should protect workers," he says, which means helping workers transition to jobs where their jobs won't be immediately under threat again from robots and lower costs abroad. Step 3: Make the political case that trade can help everyone. Trump can still pursue free and "fair" trade by being the president who enacts policies to help workers retool. Baldwin says the U.S. may need programs like "Tennessee Valley Authority," which was started in the Great Depression to revive the economy in and around Tennessee. The TVA ended up building dams and playing a large role in modernizing America's electric grid. Such a scheme could bring economic activity back to depressed areas in Appalachia. Otherwise some workers -- and their children -- may need to move to places that are creating the jobs of tomorrow. Baldwin isn't just another academic. He worked in the first Bush Administration as the U.S., Mexico and Canada were putting together key trade deals, including NAFTA. He also spent a lot of time figuring out how to react to the rise of Japan, which was producing a lot of TVs and other electronics that U.S. workers once did (today China plays that role). He still believes that global trade is the right path, but he does have one regret: The U.S. didn't have a safety net for the losers. "I don't think NAFTA needed to change. It's the domestic laws that need to help workers whose jobs were destroyed," he says.